Grand and luxurious Villa Baan Phuttarak sits in a hilltop location along Choeng Mon, overlooking a vast expanse of lush emerald greenery. The four bedroom abode boasts an excellent location, putting vacation makers within close proximity to a variety of beaches, shops, dining establishments and nightlife spots. When it is time to retire for the night, make your way to one of the four well-appointed double bedrooms. Each room is decorated in a unique theme colour, such as a deep red or cheerful orange, and features teak flooring, as well as a choice selection of oriental ornaments. Villa Baan Phuttarak’s tastefully decorated grounds contain a gleaming black-tiled pool, jacuzzi, cosy sunbeds and plenty of tropical foliage. 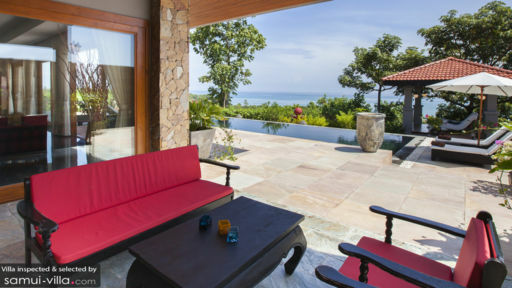 Start your mornings at the villa with plenty of fun under the sun - enjoy dips in the pool, take a picnic in the garden or sunbathe by the pool deck. When evening beckons, the outdoor bar takes center stage, serving as an excellent spot for a fun-filled pool party. Step past the expansive sliding doors from the pool deck, and you enter the commodious living area. Here, you will find a collection of fascinating ornaments, ranging from traditional drawers and rugs, to a curious-looking gong and intricate wall art pieces. The ornaments come in an array of bright hues, complementing well with the monochromatic tones of the pristine white walls and black marble flooring of the rooms. An ornate dining table, decorated with tropical blooms and pretty dishware, offers ample space for eight guests. 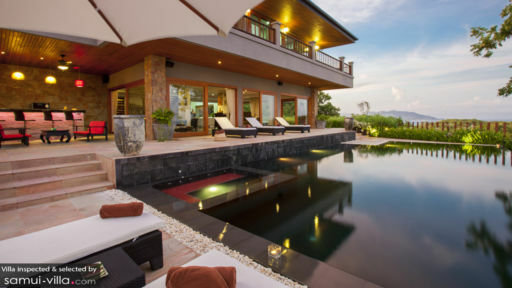 Villa Baan Phuttarak is a full service property with housekeeping service, security service, daily breakfast service, airport transfers and welcome drinks. Amenities available at additional cost include personal chef services, car rental, boat rental, child minding services and in-villa massages. 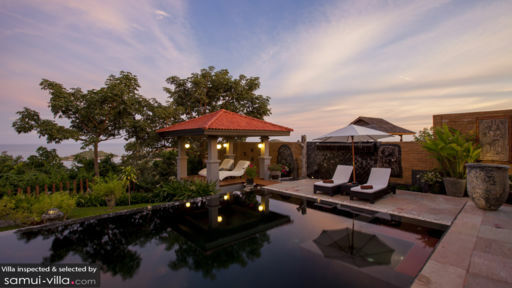 Villa Baan Phuttarak puts holidaymakers within walking distance of the paradisiacal coasts of Choeng Mon. A quick fifteen minutes’ drive will bring travellers to Chaweng Beach, the Fisherman’s Village in Bophut, as well as a diverse variety of shops, lively restaurants and nightlife spots.